Milfoil is seen around the rock island in the middle of Lake Iroquois. 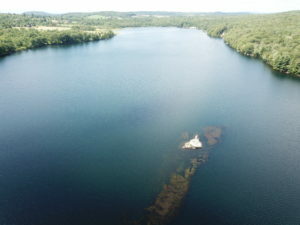 Divers are focusing on this area this month in their milfoil removal efforts. AB Aquatics, a milfoil removal contractor hired by the Lake Iroquois Association, is in the midst of three weeks of milfoil removal in the body of water shared by Williston, Hinesburg, Richmond and St. George. The company is using divers and suctions in a boat-assisted removal process to address infestation of the non-native aquatic plant. Divers hand-pull the invasives from the root then place them into a suction hose connected to the boat. The plants are later composted, and the cleared area is mapped. The company is focusing on the area around the rock island in the center of the lake, the boat/fishing access and the swimming beach. The work is funded through a grant from the Lake Champlain Basin Program. The association, a group of lakefront homeowners, last used the suction technique in 2016. It returned to the technique this year after a proposal to use a chemical herbicide was denied by state regulators. Lake users are asked to steer clear of the boat crew and divers. The association also staffs greeters who check and wash boats entering and leaving the lake, educates lakeshore property owners about runoff mitigation, no-mow zones and other best practices, and promotes riparian buffers and stream monitoring to manage runoff into the lake. More information is available at lakeiroquois.org and lakeiroquoisassociation@gmail.com.